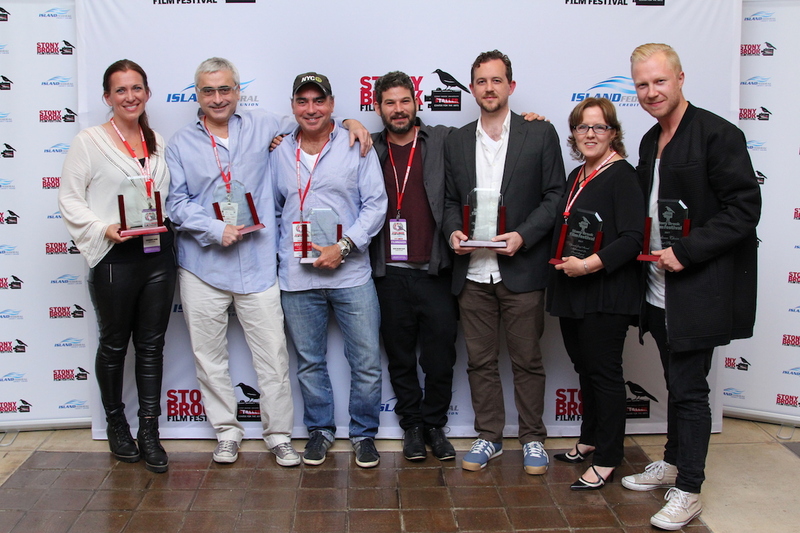 The 22nd Stony Brook Film Festival ran July 20 to 29, and had the largest attendance in the history of the Festival. The Sounding directed by Catherine Eaton walked away with the Jury Award for Best Feature. Written by Bryan Delaney and Catherine Eaton. With Catherine Eaton, Teddy Sears, Harris Yulin, Frankie Faison and David Furr. Writer-Director-Actress Catherine Eaton gives a stunning performance as Liv, a mysterious woman residing on an island off the coast of Maine who has chosen to remain silent for years. When she suffers a terrible loss, Liv suddenly begins to speak as she weaves a language out of Shakespeare’s words. After a series of events result in her being committed to a psychiatric hospital, Liv becomes a full-blown rebel, fighting for both her voice and her freedom. A powerful, uplifting drama. Produced by Catherine Eaton, Caitlin Gold, Veronique Huyghebaert, Aliki Paraschis and Jessica Vale. Edited by Marco Perez. Director of Photography: David Kruta. From Corsetless Productions. Directed by Lola Doillon. Written by Fanny Ben-Ami, Lola Doillon, Anne Peyrègne. With Léonie Souchaud and Cécile De France. In 1943, after avoiding the authorities with other Jewish children in France for three years, 13-year-old Fanny and her sisters are quickly sent to an Italian foster home. When the Nazis arrive in Italy, their caretakers plan an escape to Switzerland. Suddenly left on their own, eleven children do the impossible. Based on a true story, this moving tale of bravery, strength, and survival features exceptional performances by the young cast. Produced by Saga Blanchard, Marie de Lussigny. Edited by Valérie Deseine. Director of Photography: Pierre Cottereau. A David-Films, Scope Pictures, France 2 Cinéma, Rhône-Alpes Cinéma, and Ce Qui Me Meut Motion Pictures production. From Menemsha Films. Directed by Todd Wider and Jedd Wider. How far would you go to save your son’s life? To the Edge of the Sky follows four families as they fight the FDA to gain access to a potentially lifesaving drug for Duchenne Muscular Dystrophy, a fatal disease their sons suffer from and the number one genetic killer of boys in the world. With a promising drug on the horizon, we witness the transformation of the mothers of four boys into “the rogue moms” as they become political activists and heroes during their righteous battle against time and the FDA. A challenging and uplifting documentary from Long Island brothers Todd and Jedd Wider (Client 9, God Knows Where I Am). Produced by Brian Ariotti. Edited by Mona Davis and Colin Nusbaum. Director of Photography: Gerardo Puglia. A Wider Film Projects film. Written and Directed by Michael Ferrell. With Dana Brooke, Michael Ferrell, Jason Kravits (Unbreakable Kimmy Schmidt). Laura is a 30-something unemployed writer living in New York City and struggling with adulthood. She has a ‘weekend’ boyfriend she can’t commit to, friends who seem to have achieved their dreams, and a vivid imaginary life she uses to run away from reality. When she starts a new relationship with a coffee shop barista, real life proves too complicated and she tries to actually run away. Veteran stage actress Dana Brooke shines in this funny, fresh, poignant independent feature. Produced by Michael Ferrell, Chris Prine and Devin Sanchez. Edited by Chris Prine. Director of Photography: Paul Rondeau. From Living Boy Productions. This inspirational documentary follows several students from the Northwest School of the Arts, in Charlotte, N.C., after it is chosen to be the first high school permitted to perform the musical The Color Purple. From auditions through opening night and beyond, the filmmakers follow these students as they pursue their dreams while struggling with homelessness, low-income neighborhoods, gang-related violence and single-parent households. A behind-the-scenes look at an amazing group of teachers and students who work relentlessly to put on a triumphant musical production that propels them into a world of opportunity they never expected. Produced by Robin Grey, Sara Patel. Edited by John Disher. Director of Photography: Joanne Hock. From GreyHawk Films. A Jewish settler, hurrying home for Shabbat, encounters a stubborn Palestinian hitchhiker. A young man without legs chases down surprised purse snatchers for the girl he loves.